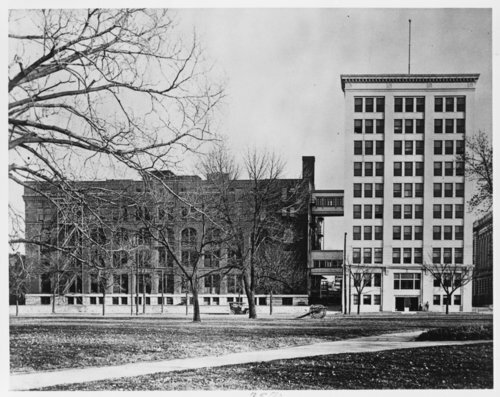 This black and white photograph shows the Atchison, Topeka & Santa Fe Railway Company building at Ninth and Jackson Streets in Topeka, Kansas. The ten-story structure to the right was built in 1910. The red brick building to the left was originally built with four stories in 1884. A fire destroyed the building on July 26, 1889. The building was rebuilt with the fifty story added in 1889. In 1923 the brick structure was demolished to make room for the future general office units that were completed in 1925 beside the 1910 building. The facility housed the company's general offices for a number of years before being purchased in the 1980s by the State of Kansas for office space. On April 15, 1987, Kansas Governor Mike Hayden renamed the building to honor former governor and United States presidential candidate Alfred M. Landon.